Happy Labor Day to my fellow USAians. I don't know how most of you celebrate it, but I like to celebrate by getting ready for the fall. Labor to me signals the end of my least favorite time of year and the beginning of my favorite season. I bought my first pot roast last weekend (it was beautiful and on sale, what can I say?). When I got home and went to put it in the freezer, I had to rearrange the entire space to get just enough room to squeeze that meat in there. 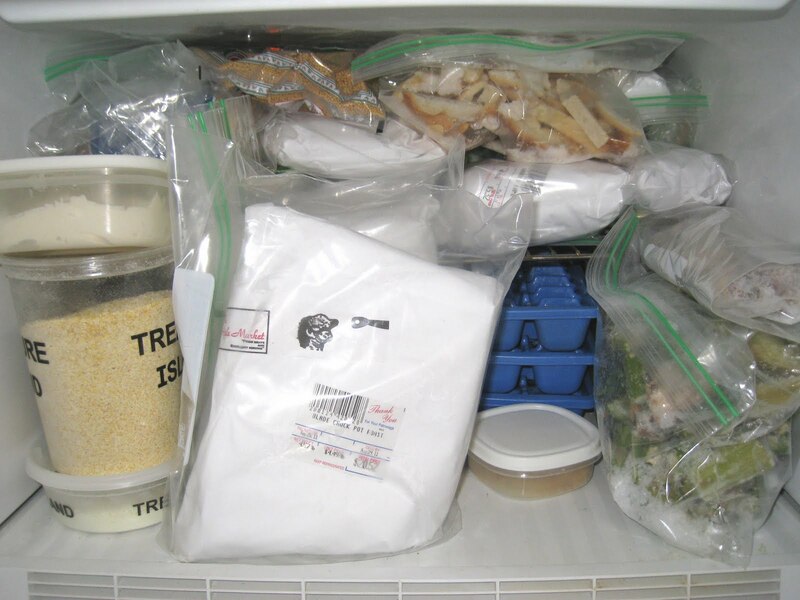 Since I like to have a lot of frozen stock on hand during soup and stew season, I decided it was time to take stock (see what I did there?) and revive Project Freezerburn so I could make room for my fall stash, which includes quite a bit of summer's bounty of corn, lima beans, and tomatoes. 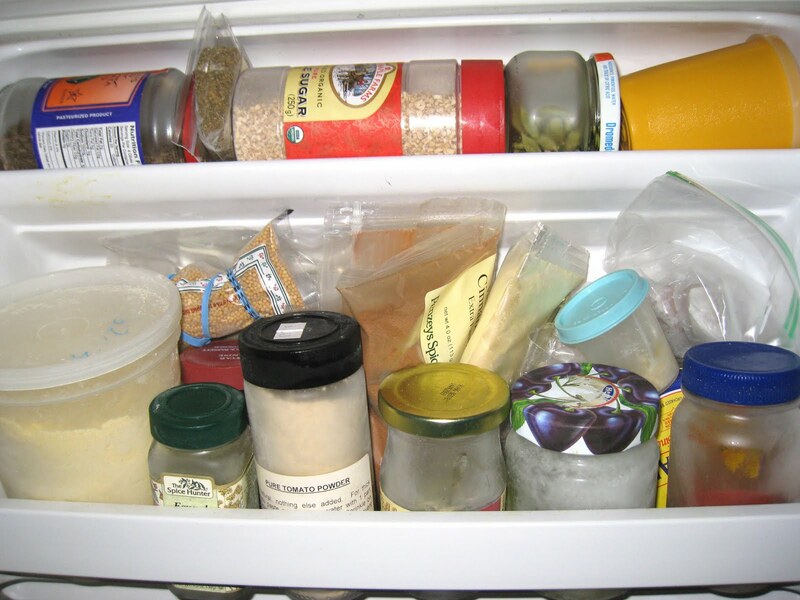 That's a lot of stuff for a small over-the-fridge freezer, so I have to rotate items frequently. I don't cook out of the freezer that much in the summer - there's so much fresh produce available that I don't have the need to squirrel things away for later use. But while I am enjoying all of that bounty, everything in the freezer just stays there. So I have several things that need to go if I am going to be able to store some summer vegetables and start accumulating stew and soup meats. I started Project Freezerburn in January of 2007. Looking at the picture of my freezer from back then, I have to laugh. It looks so empty compared to what is in there these days. In my defense, I have started keeping nuts, certain flours, and a lot of my spices in there so there is less room for actual food, but there is not one little bit of free space showing. Now picture all of that in there as well! And just for grins, here's a shot of the side door, or what I like to call my second spice cabinet. You also can't see everything that's stuffed behind those jars on the bottom, either. How do I keep track of it all? Most of it is in my head, but I finally had to create a spreadsheet for my spices, since I have so many and they are all over place. I am proud to admit that very seldom do I look at something in the freezer and have no idea what it is. That doesn't mean that I am utilizing everything, though, and that is why I first created Project Freezerburn. 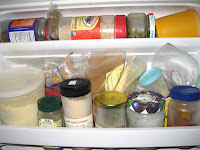 It forces me to take a look at everything in the freezer and make sure I am getting rid of some those items that have been in there a long time. So what does all of this have to do with Eggplant Pizza? I hear you ask. If you were astute enough to notice that last item that I took out of the freezer, you might have figured it out already. 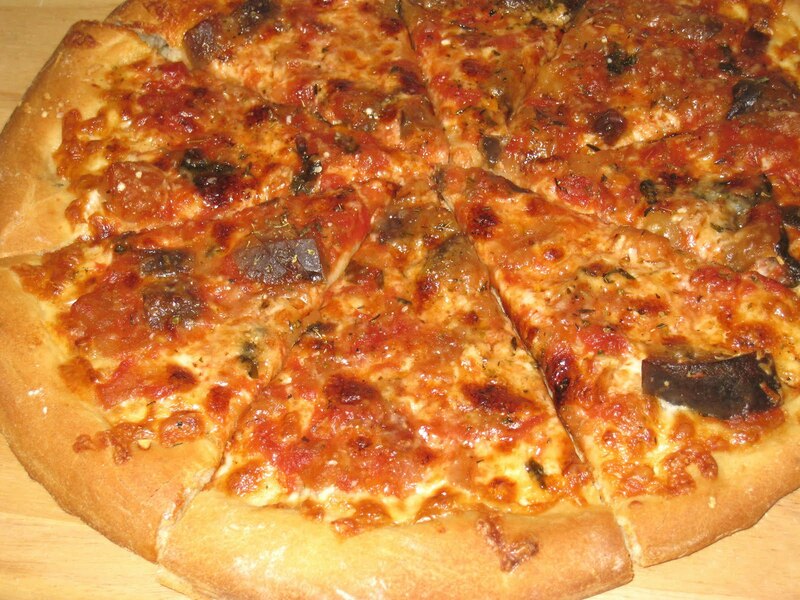 The eggplant tomato sauce made an excellent base for pizza, which is something I haven't made for a while and for which I was so ready. I took it easy with the ingredients for this pizza. After I spread out the dough, I sprinkled a light layer of whole-milk mozzarella over it, then spread a think layer of the eggplant tomato sauce over the cheese. I sprinkled a pinch of my home-made Italian spice mixture (2 parts oregano and thyme to 1 part basil) over the sauce (not too much, as the sauce was already flavored), and then I sprinkled about 2 tablespoons of grated parmagiana reggiano over the whole thing. I was a little nervous that the sauce might make the pizza soggy, so I went especially light wit it. It turned out to be the perfect amount. I am beginning to realize that with pizza, less really is more. I left off my usual garlic/onion/green olives combination, so the eggplant and the cheeses really shone. I will make this again. So far, Operation Freezerburn is a success. I am looking forward to finishing the rest of my freezer goodies. I have posted my recipe for pizza dough before, but over the past few years I have made small changes that I think enhance the flavor and quality, so I am re-posting the recipe here with those revisions. Note: any combination of flour works with this dough, for a total of about 2-1/2 cups. If you are not using semolina flour, reduce the amount of water to 1 cup. Combine the flours, salt and sugar in a small bowl and whisk together to mix well. Place warm water in a large bowl and add the yeast, whisking it together. Add the oil,then add the flour mixture and stir with a wooden spoon until the dough comes together. Turn the mixture onto a floured surface and set the bowl aside. Bring the dough together into a ball and knead, sprinkling more flour over the dough if necessary, until the dough is smooth and elastic and is just at the point where it is not sticking to your hands. Try not to add too much flour. If making one large pizza, form the dough into a ball and put it in a bowl with a little olive oil, turning it to make sure the entire surface is coated with the oil. Cover the bowl with a damp cloth or plastic wrap and let rise until it doubles in size (between one and two hours). If making two small pizzas, cut the dough in half and form 2 balls. Put one ball in an oiled bowl and follow the instructions for the pizza. Cover the other ball of dough in flour and place in a plastic bag, then put it in the refrigerator for up to 3 days (or it can be frozen for a few months). Remove from the refrigerator and let sit for about an hour and a half. Proceed with the following directions. Turn the dough out of the bowl. Move the oven rack to the lowest position and preheat the oven to 475 deg. F. and sprinkle some cornmeal on your baking sheet (you can use a round or rectangular sheet). Roll out or pat out the dough until it fits the contours of the baking sheet, pinching out the dough to make it slightly thicker around the edge. If you are pulling the dough out from the center, be sure to slowly move out with your fingers as you spread so you are not pulling from the center the whole time. If you pull from the center your pizza will be too thin in the middle. Let the dough rest for 5 minutes, then start adding the toppings. Keep in mind that you don't want the topping to be too heavy or too wet. If you are using a thin sauce, put the cheese down first so it can provide some protection. When the oven has reached the correct temperature, place the pizza on the bottom rack and bake for 18 to 20 minutes, until the crust has browned and the cheese and toppings have caramelized.